Abhinav Bindra was born in Punjab, India in the year 1982 September 28. Abhinav Bindra is one of the finest Air Rifle shooter in the world. 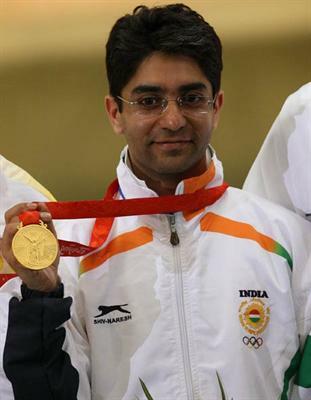 Bindra is the first person for India to win an Individual gold medal in Olympics games. This remarkable achievement was made in 2008 Beijing Olympics in 10m Air Rifle event. Bindra is also famous for the youngest sports person in India to participate in 2000 Olympic games and 1998 Commonwealth games. Amit Bhattacharjee and Dhillon was his first coaches for his early success in his carrier and now he is under the guidance of Gabriele Bühlmann who is a foreign coach. In 2000 Olympics he was not up to the mark and through his daily practice and dedication, Bindra had achieved Gold medal in 2008 Olympics held in Beijing, China. In the early age itself, Bindra had showed some amazing talents in shooting and now he is one of the best shooter in the world. Apart from Olympic games he had also won six gold medals in various International competitions. In 2001 Bindra started his success by winning an bronze medal in Munich world cup where he put a world record in junior category with a score of 597 out of 600. Bindra again showed some amazing performance in 2002 Commonwealth games where he won an Gold medal in Air Rifle category of shooting. Olympics held in 2004 was not good for him and he had not won any medals in that Olympics. In 2006 Bindra come back in World Championship meet by winning an Gold medal. Bindra also won a Gold medal in 2006 Commonwealth Games held in Melbourne. In 2008 he became the first person for India to win an gold medal in Beijing Olympics 10m Air Rifle event. Bindra completed his BBA graduation from University of Colorado in America.